Joining the continuing developments of making speakers smarter, Logitech has unveiled its all-new range of UE Blast and UE Megablast speakers with support for Amazon's Alexa voice assistant. The new speakers come as an upgrade over the previous UE Boom 2 and UE Megaboomspeakers that the sub-brand Ultimate Ears launched back in 2015. While the UE Blast will go on sale for $229 (approximately Rs. 15,000), the UE Megablast will hit stores at a price of $299 (roughly 19,500). 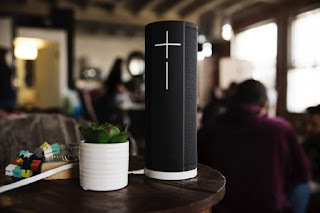 The Amazon Alexa voice assistant integration into the UE Blast and Megablast speakers make them capable of controlling music directly from services such as Amazon Music, iHeartRadio and TuneIn when connected to Wi-Fi. Options such as Pandora and Deezer are also expected to be available for the speakers soon. However, the voice controlling feature is initially limited to users in the US, UK, Germany, and Austria. If there isn't any active Wi-Fi connection available at your place, you can use Bluetooth and play audio from your mobile devices wirelessly. It is worth noting here that both the models have left behind the iconic 3.5mm jack, and previous features like Bluetooth-based Double Up and Party Up are no longer available against the shine of Alexa support. The UE Megablast is touted to be Ultimate Ears' loudest and best surrounding speaker to date, with a maximum sound pressure level of 93 dBC. This makes the speaker 40 percent louder than UE Megaboom, the company said. The new UE speakers are the not first ones to bring Alexa integration, and Amazon has itself tested the market with its Echo range. Nevertheless, the built-in battery makes the new development far better and more useful than the Amazon Echo family. The UE Blast has a battery life of up to 12 hours, while the Megablast can last up to 16 hours on a single charge. Logitech has also provided an optional Pogo pins-equipped charging dock called Power Up that helps you charge the speakers without worrying about any cable management. Both the UE speakers additionally have a colourful build with water and dust-resistant design that has IP67 certification. This makes the speakers capable of being your swimming partner. Logitech claims that you can immerse them in up to three feet of water for up to 30 minutes. "With Blast and Megablast, we brought together everything that our fans loved about our Bluetooth speakers -- amazing sound quality, waterproof, ready-for-anything design -- and upped the ante with Wi-Fi and far-field voice recognition with Amazon Alexa," said Charlotte Johs, general manager of Ultimate Ears, in a press statement. The UE Blast and UE Megablast come bundled with a three-month subscription to Amazon Music Unlimited. This will enable you to listen to many of your favourite tracks for free -- just by using your own voice through Alexa.